Yummy looking, yes? I Googled a few versions of the recipe and then added my own mistakes improvements spin. I started by slicing the avocado in half and removing the seed. I also peeled it, which if I'd been paying attention, I would have noticed wasn't done in the original photo. At the time, I figured I didn't want to eat the skin, but I think I'll leave it on next time. It will help the avocado stay formed and reduce the egg runoff that occurred. Plus, I still don't have to eat the skin - it'll just be a natural bowl (I still recommend placing it in a ramekin regardless). Each half of the avocado went in it's own ramekin. Look at that one in the back. A bit of a hot (cold?) mess. Then I started adding seasoning. Caraway seeds went first (they give a nice kick to a dish), then sea salt, pepper, a dash of ginger, and a teensy bit of steak seasoning. I was totally flying by the seat of my pants. Next, a cracked an egg into each half. Even those this was going to be baked, I ended up breaking the yolk a little just to mix it up. 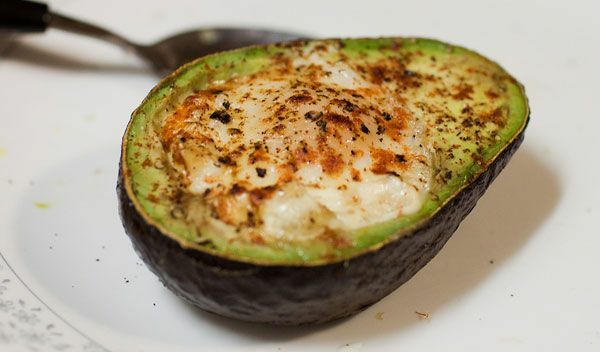 A lot of the egg white spilled over the sides of the avocado. I scooped some back into the hollow but decided it didn't really matter. I do think if I'd left the skin on the fruit there'd have been less egg spillage. I took a potato peeler and scraped off some very thin slices of cheddar. I am the only person I know who will take a potato peeler to a hunk of cheese. I swear, it's very useful! Then I broke a few larger chunks of cheese in. The original recipe called for cooked bacon to be sprinkled on top after baking. I didn't feel like cooking bacon, so I cut up two pieces of pepperoni per ramekin and sprinkled it on top. More seasoning on top of all that. I preheated my oven to 425 per most of the recipes I saw, but clicked the dial to convection heating. I figured a little extra evenness would help. I put the ramekins on a foil lined baking sheet to minimize spillage. Then I waited for twenty minutes. A little nervously. Tip: Do not take medication that needs to be taken with food before you know for sure that said food will be edible. I had my fingers crossed that I wouldn't have to wait twenty minutes and still cook myself breakfast if this didn't turn out. Mine looked much more like a casserole than the cool egg in avocado in the first photo, but it tasted delicious. Seriously. The crispy pepperoni was just the right texture and amount. The avocado was rich and filling. The spices were singing. Even the egg overspill tasted good. Now that I've done it, I estimate the next batch taking about five minutes of prep. Very easy to assemble before hopping into the shower, etc. This will be making regular appearances for sure. I have this pinned too! Kudos for making it. I'm inspired to make it now too! Perhaps this weekend! I'll keep you posted. Um this looks delicious. I love avocados. You've inspired me to try them another way. This looks soooooo good! I have done this with just eggs but the pepperoni, I'm sure, just took it to the next level!